Want to Approach Property Owners Direct? Using our comprehensive 'Western Hunting Information Guide' you can approach property owners direct. 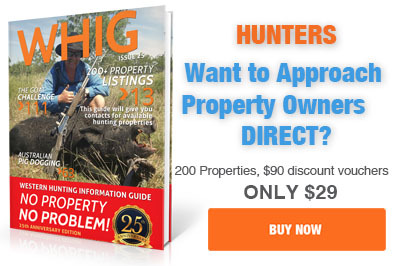 Do you want to approach Property Owners direct to arrange your own hunting adventure? With our exclusive, comprehensive Western Hunting Information Guide, you can approach property owners without needing to use IHP’s services. 25th-anniversary edition 2018 WHIG is out now! 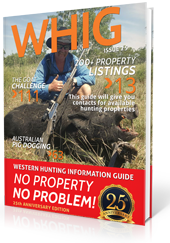 Our thickest WHIG book ever - 128 packed pages of private hunting properties, our full list of 200+ properties to book plus hunting articles and how to guides. Full-colour limited print run - grab yours now via the link below - still only $29 dollars and includes $90 in WHIG dollars to redeem at selected properties. Be sure to provide your name and address during online checkout. The WHIG comes with a 30-day, no-risk, money back guarantee.